Happy brand new 2018! We are happy to kick off a new year bringing you more collaboration websites for and by teachers. The one we are presenting this month is Busy Teacher. It holds more than 17,000 worksheets devoted to kids, young learners and adults enhancing their speaking, reading and vocabulary skills. 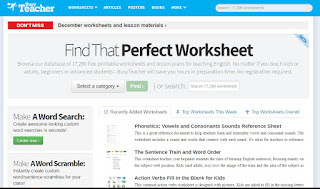 Moreover, every single worksheet is free and it only requires e-mail registration.